Top seed Dawn Morgan reached her 3rd final and will play against the unseeded Chas Elliott (pictured) in the final. Morgan's toughest test came against 3rd seed Mark Pipet in the semi finals and a high quality encounter ended with a 5 game win for Morgan. The crucial leg came with the match tied at 1-1 and it was Morgan who clinched it 16-14. Elliott made the most of the withdrawal of 2nd seed Phil Hunkin and upset the odds with a 6 game win over 4th seed Kay Chivers in the semi final. Trailing 2-1, he won the following 3 legs by the narrow scores of 11-9, 12-10, 11-9 to make his 2nd final of the 2015 Championships. Ian Fitchet and Maurice James will contest the final. Fitchet made no mistake whatsoever against John Wills and cruised through in straight games, all ends won 11-4. 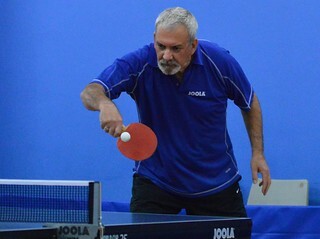 James defeated Peter Powell in 5 games, but it was the 3rd which proved key, whilst the match was tied at 1-1. Powell held a strong lead throughout, but multiple game points were lost and James pinched it 13-11. This set him on his way to comfortable 4th and 5th game wins.